The winter is over and spring has sprung! With spring comes life and newness. God has promised to do a new thing within me this season. I can’t stay in the same place, do the same things, have the same mentality and expect God to do something fresh within me. I have been praying and asking God to help me get to the place I need to be so that He can do the work He wants to do. In order for that to happen, I need to allow Him to do some Spring Cleaning. During our Winter season in life, things die that are no longer of any use to us along with those things that were not supposed to be there in the first place. God allows these things to wither and die so they can be removed in time. Ecclesiastes 3:1 (NIV) says: There is a time for everything, and a season for every activity under heaven. Spring Cleaning isn’t something new to many people. At the end of the Winter season and the beginning of Spring we take time to go through everything we own and clean it all up. We get rid of things that we will no longer use and either trash or donate it all. We do this in order to make room for new things. We reorganize our closets and trade in our Winter gear for our spring time fashions. We clean our yards and begin to plant seeds and plants, etc. You know your routine for Spring cleaning. God comes into our lives and cleans like crazy. He removes every dead, useless, unnecessary and poisonous, out of season thing. The only problem with this is that we are not always willing to let go of everything. Many times we hold on to the very thing that is blocking our blessing. In Ephesians 4:31 (NIV), we are instructed to “Get rid of all bitterness, rage and anger, brawling and slander, along with every form of malice.” When God begins to clean, He reveals things that we never thought could be within us or at least never wanted to admit to. In order for the cleaning process to be complete He had to remove these things. I am guilty of holding on to dead things including the things listed in Ephesians 4:31. During my lifetime (which has been relatively short compared to some people I know), I have gone through the tests, trials and tribulations that winter brings only to hold on to the remnants of the past. Not realizing that these things I treasured were not only dead but were weighing me down and keeping me from all the promises God made me. I needed to let go and let God do His work. It’s like hiring a landscaper and not letting him get rid of weeds, dead trees, trash or anything else that is causing the property to look bad as well as aiding in the destruction thereof. As long as all of that is there, nothing will be able to grow because it will kill it before it has a chance. Not only is time wasted but so are money and the opportunity for potential prosperity. We have to let go of the things that are destroying and killing us. I know that it is hard at times and while we don’t see things as God does, we have to trust Him no matter what. That’s where Psalm 51:10 comes in, we have to ask God to renew our minds so we can understand and mediate on His plan. We also have to ask for a steadfast spirit so we can actually put His plan into action. I will admit that I am still in the process of learning to fully trust God in everything. I know He knows what is best for me and that as long as I allow Him to have His way; things will always work out for the best. God knows what is necessary in order for our Spring to be fruitful. He knows what we have to get rid of and what we have to keep. Please forgive us for being disobedient and holding on to things we were instructed to let go of. We did not understand that we were causing our blessings and growth in You to be hindered and possibly destroyed. Please allow us to see You as our landscaper and Spring Cleaner. We know that You are so much more than that, but at this time that is what we need for You to be. Allow us to remember Ecclesiastes 3:1. Please help us let go of everything that is not meant for this season and grab hold of what is so that we can be blessed. In Jesus’ Name, Amen! Ladies, I EMPOWER us all to let go of EVERYTHING God has instructed us to let go of and allow Him to clean and do His work. I know that none of us will regret it. What things will you obediently get rid of this season? Next postWhen the Heat is Turned Up! Powerful coming from someone her age. I thank GOD daily for how Bettina has grown and pray that GOD will keep me to be able to see her grow even more. Many BLESSINGS to you Lady Bug. Your Mom. I love you. Beautiful post! 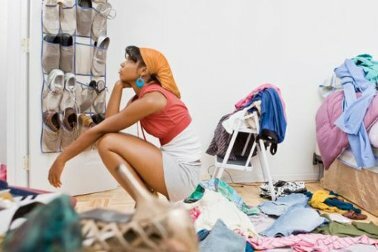 I know I have some spring cleaning to do both spiritually & also w/ my closet/room. It’s hard for me to let things go. I’m working on it!